You're more likely to see me in a pair of points or round toed heels than a pair of converses or vans! However, recently I have had to wear flat shoes more due to an injury and my eyes have become opened to the many fabulous flats that are out there! I've found out that flat shoes can still look elegant and classy rather than frumpy and there are many different styles to choose from other than the classic ballet pump! The style that has grabbed my attention is the 'slipper style' flats -also dubbed 'smoking slippers'...(think Hugh Hefner...he seems to be the person best described to wear these!). They look like traditional gentlemens style slippers, which were designed to be worn around the home, but this style has crept into women's fashion and seems to be everywhere and is outselling every other style of flat. 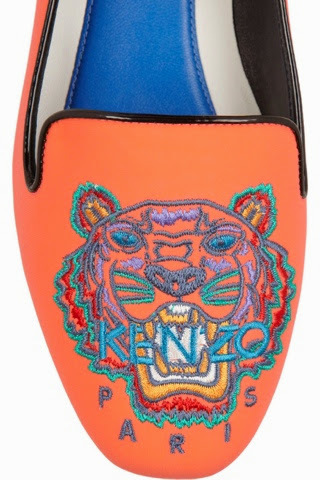 I really love the Kenzo 'Tiger' flats (above and below). Kenzo have completely reinvented themselves with the introduction of the tiger motif which has become a cult classic with the fashion crowd-particularly their tiger motif sweatshirts. 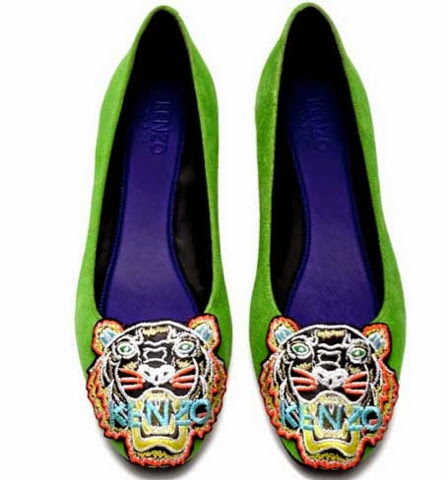 - The green coloured Kenzo flats (my favourites!) are sold out everywhere. 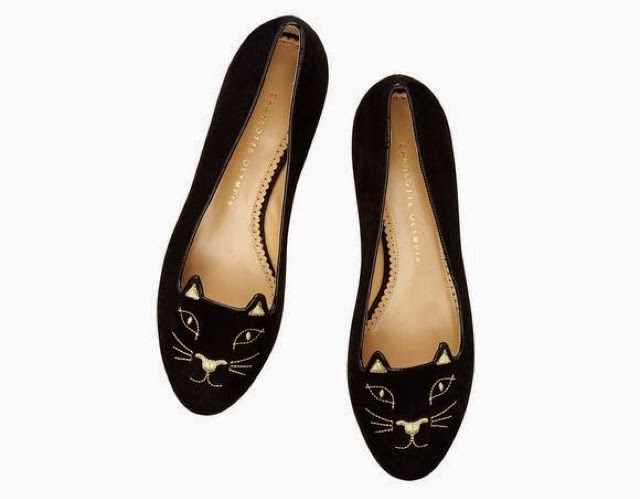 Charlotte Olympia. Another label after my heart. 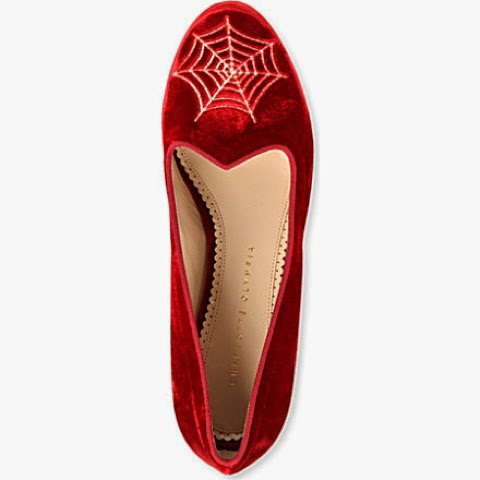 Again, their smoking slipper flats have gained a cult following. 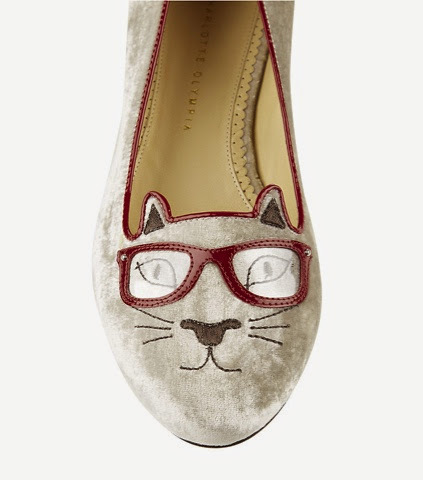 Charlotte Olympia have given them a quirky makeover with cute kitten faces, the infamous Charlotte's Web and there are also a range with starsign and Chinese New Year signs. Apart from the designer options, there are many of these slipper flats on the high street including Office, TopShop and even the supermarket brands like Tesco and Asda etc. I love the ones in luxury fabrics like velvet and suede, but there are also neoprene, metallic snakeskin and leather versions. Wear with tailored, cropped trousers or play it girly with a short flirty dress. The little cat shoes are so adorable!